UPDATE: The talkshop pledge is now up to £500 + a reserve, see comments. Brexit: The Movie, is a new project set up by Martin Durkin, of ‘The great Global Warming Swindle’ fame. Martin is a top documentary maker, but none of the big TV channels are going to finance this one. Check out the trailer above and you’ll know why. Climate sceptics have a lot of reasons to be eurosceptics too, given the nutty energy policy being dictated to the UK from Brussels thanks to their mad climate policies. So once again, it’s time to dip into our pockets and help make things happen. Martin has a kickstarter page up and is soliciting for donations to finance the film. Or if you don’t want to hand over your bank details to Kickstarter, drop a donation onto the paypal link here at the talkshop and I’ll add it to the donation I’ve already made at Kickstarter. If we get the talkshop donation to £500 then a lucky winner and I get to go to the premiere and have the chance to put the talkshop point of view to the politicians and film producers there on everyone’s behalf. Also, there will be a prize draw for a pin badge, DVD and T-shirt for three lucky donors. Thanks for your consideration, let’s make it happen! “This doc will turn apparently abstract issues (of politics and economics) into concrete reality (the price of stuff, the laws that directly affect us, how much trust we’re willing to place in politicians and bureaucrats). Too often the debate about the EU has a lofty and academic tone – the concern of political scientists and expert economists. This film will make it tangible. “The decision we take in this referendum will shape our lives. What is at stake is our prosperity and freedom, and the ability to control our own destiny. This movie spells it out, in the most direct, hard-hitting way. The movie will be marked by the simplicity and clarity of its message, and by its emotional impact. The argument has an iron logic but it will be delivered with passion. “Nor will the movie shy away from the arguments of those who support the EU. On the contrary, not only will we turn every pro-EU argument on its head and show the error and cynicism behind it, we will directly confront, and embarrass, the people we are arguing against. It causes explosions of the volcano. A magnitude 7.1 earthquake knocked items off shelves and walls in Alaska early Sunday. The earthquake was widely felt because it was close to Alaska’s population centers. There were no reports of injuries, but four homes were lost to natural gas explosions or fire following the earthquake. OK; so a french resident of many years has fait a don of £30 to Roger. Now its your turn you brits. Save your country from a bunch of corrupt, incompetent idiots while you can. Afterwards you will be ruled by brussels. Socialism gone mad. Cameron is negotiating the wrong deal. He should be negotiating the exit. EARTHQUAKES struck today in a volatile region that saw TWO massive volcanic eruptions less than 24 hours ago. Fantastic, thanks Stephen and everyone who has donated. So far, I’ve been able to up the pledge to £140. We’re over halfway to our initial £250 target. As Stephen says, it’s up to us true Brit’s to save our country, and getting Martin Durkin’s movie financed is a step along the way. Please donate if you can – thanks. El Niño is weakening. Stain of cold in the Atlantic is growing. There is a post at Euan Mearns’ forum Energy Matters where they are discussing the Radiosonde data and the Atmosphere. UV came up and I remembered you post great deal of info on Polar UV. Could you find the time to take a look at the post and add any comments that you consider appropriate? 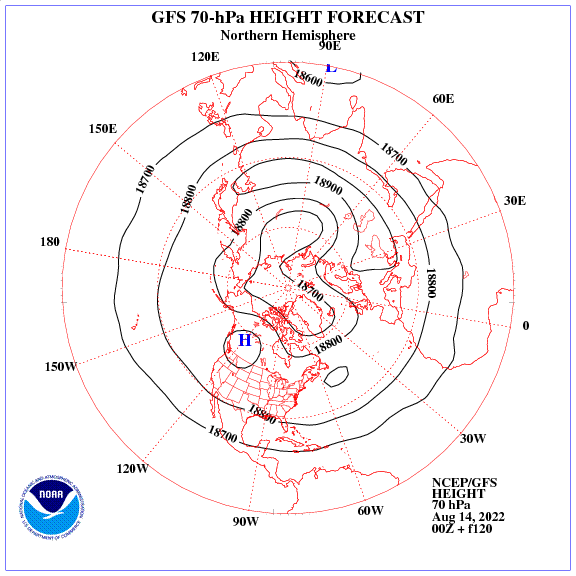 When is growing energy troposphere tropopause is raised up. Air particles perform work against the force of gravity. A couple more donations have come in. We’re up to £150. Please consider investing a few quid in getting your country back. Superstar, thanks Sean. Come on you Brits, half the donations so far are from abroad! If you want to be less skint, invest in escaping the EU. Second-hand slightly used country for sale. Only worth £170. Who’ll bid me £10 to start improving it? Let’s not pussyfoot around if we want our country back. Stephen, you are a superstar! Well done you. I’ve upped the talkshop pledge to £500 which gives us two tickets for the premiere, and kept our previous total, (currently £190), in reserve so we can draw another prizewinner for a third ticket to the premiere when we reach another £250. I’ll make a separate donation for that, so we get an extra T-shirt, badge & DVD to put in the pot for the prize draw as well. Come on folks, lets do it! Well done Stephen. A true brit with the courage to back his people. COME ON YOU BRITS NOW IS YOUR FINEST HOUR. KICK OFF THE COMMUNIST SHACKLES OF THE EU MESS BEFORE IT’S TOO LATE. David Davis spoke extremely well at Manchester. jmac: Yes, excellent, as were Kate Hoey and Nigel Farage. Very strong deadly earthquake below Southern Taiwan (Tainan). The jet stream goes far to the south. Strong rain in the west of England. More donations have arrived. We are up to Stephen’s £500, and £240 in the reserve. Just another tenner and we have a third premiere ticket and another goody-bag! Donated both here and direct to Martin’s Kickstarter page. Thanks Phil! That means we have enough for another premiere ticket. I’ll be talking to Martin Durkin on Friday so I’ll ask if they want a separate donation of £250 or whether to put it all in one. Hopefully the latter. It’s Day 8 of our Kickstarter campaign and time for an update! What a week we’ve had… Honestly, we had no idea what to expect when we launched this campaign. Would people like the concept of the film? Would we get any backers at all? We’re very happy with our start. 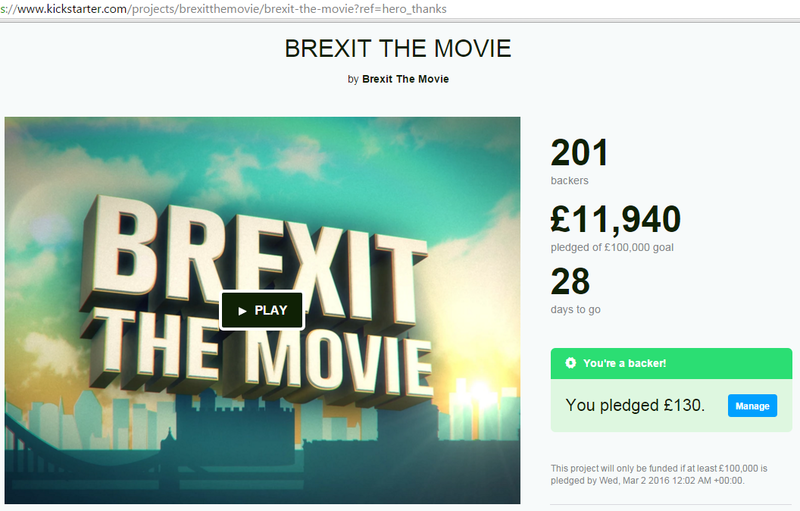 At the time of writing, over 350 people have pledged their support BREXIT THE MOVIE, offering a total of over £23,000. Pledges have ranged from £5 to £3,000, and we’re incredibly grateful for every one of our supporters. However, we’ve still got a long, long way to go if we’re to raise £100,000 by the end of March 1st. And in order for people to back the project, they need to know that it exists. A post on Guido Fawkes’ blog helped drive hundreds of backers to this site, and our Director Martin Durkin’s been busy, writing an article for CapX, and a debate piece for CityAM. But we need to make more noise still, and that’s where you come in. If you’re reading this post and want to see BREXIT THE MOVIE happen, please spread the word! There are so many ways you can help us reach our target. – Email the Kickstarter campaign to your friends – Talk to your family and friends about the film in person! What we’ve seen this week is the passion and the generosity of the Brexit movement, and we’re confident that we can get this film funded if we can generate enough excitement about it. And speaking of the wider Brexit movement, just a couple of points on where BREXIT THE MOVIE stands in terms of campaigns and messaging. It’s worth repeating that we’re totally independent of all other Brexit campaign groups. Frankly, we don’t give a damn about personality clashes or anything other than achieving a Leave outcome in the EU referendum. All we care about is making the best film with the best stories and the best spokespeople that we can. We’re thankful to have received support and endorsement from members of several of the Leave campaigns, and will be working alongside all of them in order to Leave the EU. We also know that we won’t convince the public just by wheeling out a succession of ‘talking heads’. Our trailer might be quite spokesperson-heavy, but the complete BREXIT THE MOVIE will focus strongly on the stories of everyday people, their experiences, and what leaving the EU means for the typical family. BREXIT THE MOVIE is a film for the public, funded by the public, telling the story of the public. Thank you everyone for your support of BREXIT THE MOVIE so far, and if you have any questions don’t hesitate to get in touch. Now, let’s get this thing funded! An independent, crowd-funded initiative to produce a feature-length film making the case for Brexit has won support from both the grassroots Leave.EU campaign and senior figures in the rival Vote Leave organisation, including Lord Lawson, Daniel Hannan and Douglas Carswell. Brexit The Movie will be produced by the award-winning documentary filmmaker Martin Durkin – if he can raise £100,000 for it on the crowd-funding website Kickstarter. The project broke through the £30,000 mark last night, but only has until the beginning of March to raise the remaining sum. 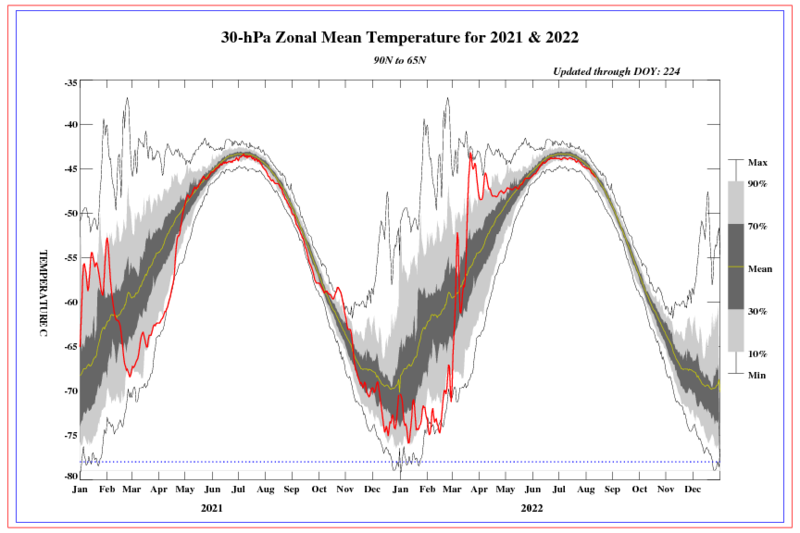 Tallbloke declining solar activity, increasing pressure in the stratosphere. Jet stream falls far south of Europe. Ren, yes, it’s frosty here in Leeds this morning. Two independently-made computer forecast models depict a dramatic change in sea surface temperature anomalies in the tropical Pacific Ocean between now and late 2016. The first forecast map shown above comes from the Japan Meteorological Agency and it predicts big changes in SST anomalies between the March/April/May and September/October/November time periods. The warmer-than-normal SSTs in the tropical Pacific Ocean (red region) reverse to colder-than-normal (blue region) conditions by this fall. 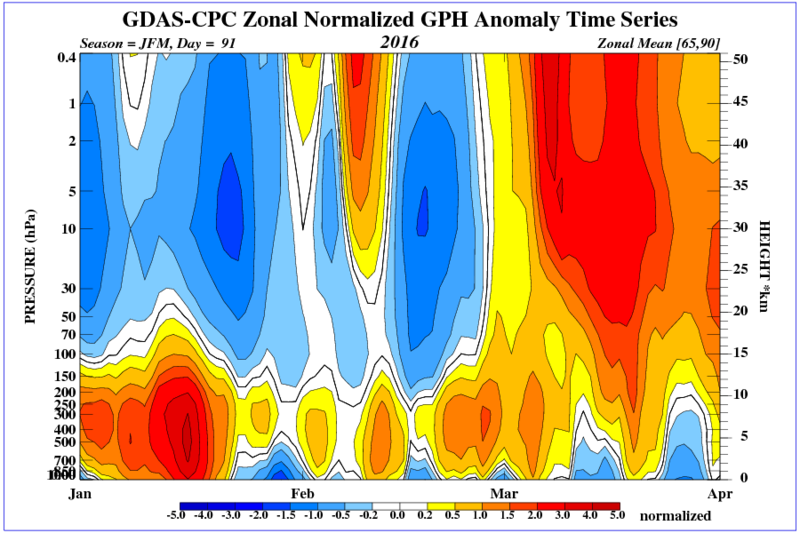 A second model generated by the Scripps Institute of Oceanography provides support to this flip as it also shows a dramatic change from El Nino conditions (yellow, orange) in the spring to La Nina (blue, green) conditions by the upcoming fall and winter seasons (below). Great news. Martin sends his thanks to all talkshoppers who have donated and says he can make extra premiere tickets available to those who donate via here! So let me know if you wanna go, and I’ll notify him of numbers. Stephen Wilde met up with us down there and has made a very substantial donation to help get Brexit The Movie rolling. The film is now going ahead, thanks to everyone’s help. We had an excellent two hour discussion which also covered climate science issues, and we will have further involvement in shaping the next film Martin makes on the subject. Have you noted that all the people and organisations that want the UK to stay in the EU want it for themselves and NOT the brits.?? In the USA we have Lincoln’s birthday, MLK day and many more. If the United Kingdom with its illustrious history accorded each of its notable leaders with a holiday there would only be a handful of working days left. The UK therefore sets public holidays according to the Church of England calendar (Christmas, Whitsun, Easter etc) plus “New Year’s Day” and “August Bank Holiday” so there are no days left for famous people………………………except for Guy Fawkes. November 5 is not a public holiday yet it is celebrated with enthusiasm equal to the 4th of July in the USA. As the movie “V for Vendetta” suggests, we love Guy Fawkes because he reminds us that tyranny must be opposed. @Aaron_Swain_ @doggywoggydooda @SeanMasonjon @MikkiL Great idea. June 23rd will henceforth be known as #Brexitday, a national celebration! That’s a brilliant idea. Perhaps we in france could call ours head up arse day. That’s where the socialists keep it. We’ve helped make this happen. Well done everyone. Don’t forget to let me know if you want to go to the premiere. EU will make decision on British demands only AFTER the British people have voted FOR staying in the EU. EU-Parlamentspräsident Martin Schulz …wollte Cameron keine Zusage geben, dass alle Wünsche aus London bei künftigen Gesetzesvorhaben erfüllt werden: “Das EU-Parlament tut sein Möglichstes, um den Vorstellungen entgegenzukommen, aber wir können nichts garantieren.” Er könne lediglich zusagen, dass sich das Parlament umgehend mit der Änderung von EU-Gesetzen beschäftigen werde, sobald das Referendum in Großbritannien über den Verbleib des Königreichs in der EU abgehalten worden sei und die Kommission entsprechende Vorschläge mache. Rough translation: The EU parliamentary president Martin Schulz (a German guy) does not guarantee that Cameron will be granted his demands. First the British people have to vote in favour of staying in the EU, and then the EU parliament will be asked to decide on Cameron’s wishes, but only after the EU Commission has made respective proposals. How dumb do they think the British people are? First they must vote in favor, and then, perhaps, maybe, possibly, perchance there could be an initiative that maybe, perhaps, perchance results in the EU granting Britain a favour (which is denied for all other countries). The EU, famous for their back room deals, breaking all applicable laws whenever convenient, is now remembering that their is a (toothless) parliament, which can now be used to f*** the British! This is like raising that one finger of both hands towards you. I am surprised this has not resulted in an uproar in Britain, and this is not mentioned on talkshop. What do you need a Brexit movie for, when you have that kind of statements from top EU folks? 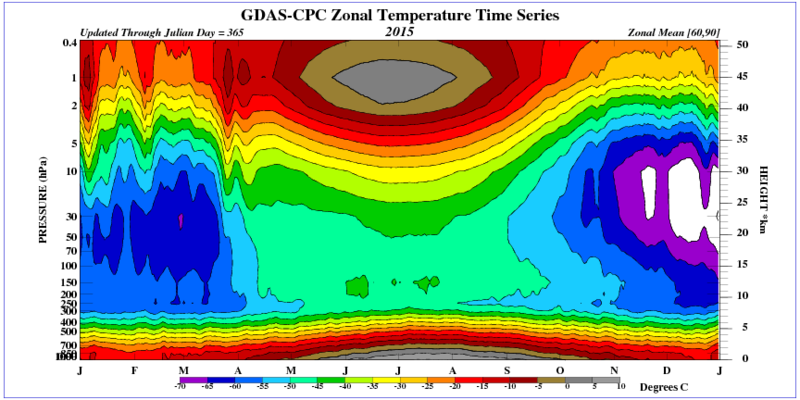 Jump temperatures in the stratosphere. Tallbloke early March will be winter in Europe and eastern North America. 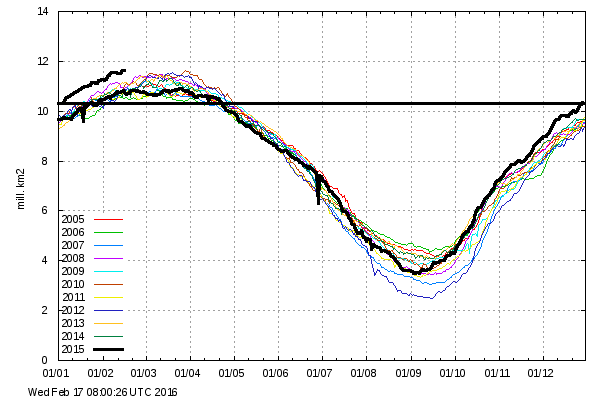 I see it is that interesting time again where both poles are increasing their ice…. Visible steady growth in the galactic radiation. Roger I put another €40 or so in your kitty for brexit. pass it on please. Ta!! Thanks Stephen, now added. And the project has nearly reached its initial target too!